One of the frequently occurring BSOD error is KMODE EXCEPTION NOT HANDLED with code value 0x0000001E. Many a time users notice that their Windows operating system has abruptly stopped working by giving a blue screen error. In this article, I will explain one of the BSOD error and elaborate how to fix KMODE EXCEPTION NOT HANDLED bug check. A stop error KMODE_EXCEPTION_NOT_HANDLED specifies that error handler could not catch the exception which was generated by kernel-mode application. 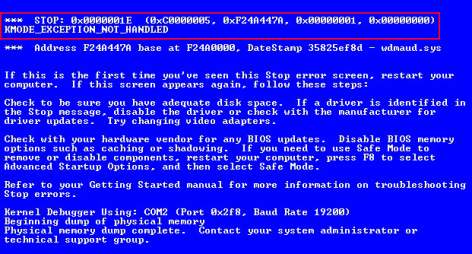 This type of BSOD mostly occurs in Windows 8, Windows server 2003 R2, Windows Server 2003, Win Server 2008 R2, Win Server 2008. This bug check contains 4 parameters with their own meaning, Parameter 1 is the exception code, 2nd tells the address of exception, 3rd is the parameter 0, and 4th signifies parameter 1 of the exception. There are some common reasons for occurrence of this error like incompatible hardware, and faulty drivers. Given below are the reasons and how to fix KMODE EXCEPTION NOT HANDLED. This stop error may appear if your system is having issues in memory then there is a need to run memory test. To do this, go to control panel then go to diagnose your Computer's Memory Problems. If it shows error that cannot be fixed then you have to replace RAM. If the error arises after installing a new hardware then there are chances that a newly installed hardware is not compatible with your installed version of Windows operating system. To fix KMODE EXCEPTION NOT HANDLED bsod error, check compatibility of your hardware from Microsoft website. One of the main reason of this error is faulty or incompatible device drivers. If the faulty driver is appeared in blue screen then uninstall it as soon as possible. To solve the issue, you can also remove or disable recently installed driver. There are chances that BIOS is causing this problem. In order to fix KMODE EXCEPTION NOT HANDLED, Windows users need to disable caching or shadowing BIOS memory options and check if BIOS updates are available.